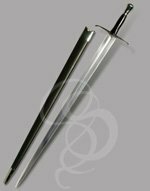 This design is based on the traditional medieval arming sword. 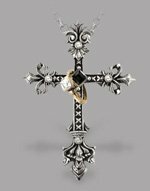 It is beautifully crafted and features a blade with a wide fuller. The wooden grip is covered with wrapped leather cord. It both attractive and functional; providing a sturdy reliable grip. The large round pommel counter balances the blade providing for a very nicely balanced weapon. 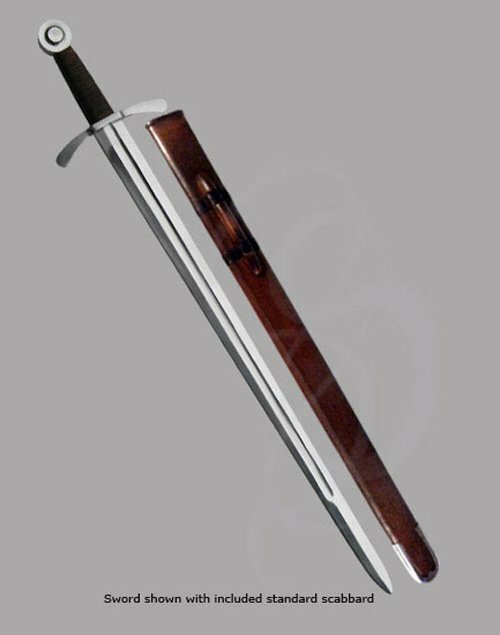 Included is a leather wrapped wooden scabbard. Hanger Scabbard sold separately. 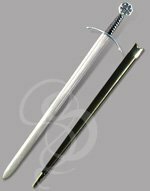 The sword is available in both unsharpened and sharpened versions. Just a quick note to let you know I received my sword today and it's just perfect. 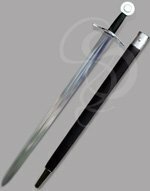 Shipping was fast, the blade and scabbard were in great shape, and the engraving was PERFECT. I enjoyed the "Care and Feeding" guide - glad to know you've got a sense of humor (as you should have, selling Medieval swords!!). Very satisfied, and will shop here again as I costume up for the next Renaissance festival. Actually I'll be a holdout from an earlier age I suppose. Thanks again for the great service.